Just three months ago Grulla students wrapped up their middle school work, turning in that last paper or test. That triggered the start of a new chapter in their lives – they became “fish”. Why fish? It’s a nickname commonly used across the United States to refer to incoming high school freshmen who are new fish in a big pond. And just like their counterparts in nature, with a little help and instinct, will learn to navigate the system, grow and become models for other young fish in the future. The 241 fish of the Grulla High Class of 2016 took the first big dive into that new pond by attending Fish Camp, otherwise known as Freshmen Orientation, at Grulla High School in mid-August. 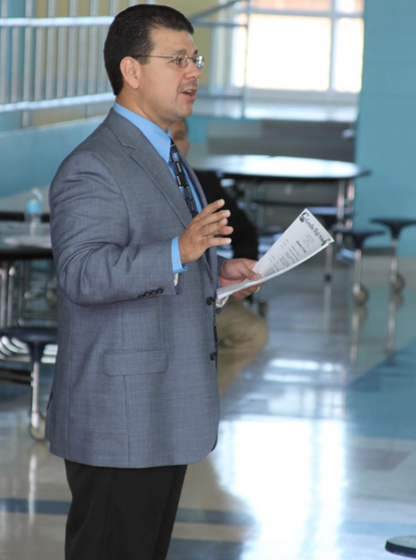 They met Principal Joel Trigo Jr., as well as members of the school’s administrative and counseling team. They learned about the student code of conduct, academic standards and testing, dual enrollment opportunities, the classes they will take in the fall, as well as the many services available to them as high school students. The highlight of the camp was an organization fair, where students met with advisors and upperclassmen who participant in the various clubs and organizations available through the high school like the band, drill team, student council and National Honor Society, to name a few. The fair gave incoming freshmen a chance to ask questions about student activities at the school, learn about requirements and start getting into the Gator spirit. The activities concluded with a pizza and soda lunch, which gave students a chance to get to know each other or, in some cases, catch up on a summer of fun. Grulla High Principal Joel Trigo Jr addresses the new freshmen. Incoming Grulla High freshmen learn about great opportunities at their new school.